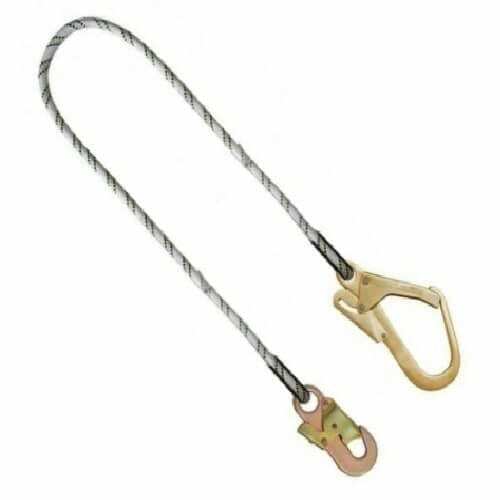 With 1m, 1.5m and 2m versions available, the FA40 503 10-15-20m Restraint Kernmantle Rope Lanyard also distinguishes itself by including a scaffold hook and snap hook at opposing ends. This makes it simple to use and sturdy enough to ensure complete safety. Rugged rope, high quality hooks and plenty of protective elements make this rope lanyard range well suited to the toughest of restraint tasks. All three lengths that we stock are manufactured to the same standards, complete with 12mm thick kermantle rope, thimbles in the loops to resist abrasion, a sleeve to prevent damage to the stitching and hooks made from alloy steel. The first hook is a scaffold design, while the second is a smaller snap hook that should be just as hard-wearing. The entire assembly offers a minimum breaking strength of 22kN, so it should restrain users and prevent accidents from leaving them with serious injuries. If you would prefer a restraint kermantle rope lanyard with nothing but thimble eyes at either end, we offer just such a product. If you need a restraint webbing lanyard instead, you will also find a fine example on our site. If you want to improve your knowledge of height safety equipment and talk through what you need with an expert, call or email the Rope Services Direct specialists. We are available for a chat on 01384 78004 or an email conversation kicked off through our site. 10-15-20m Restraint Kernmantle Rope Lanyard Overall rating: 5 out of 5 based on 6 reviews.